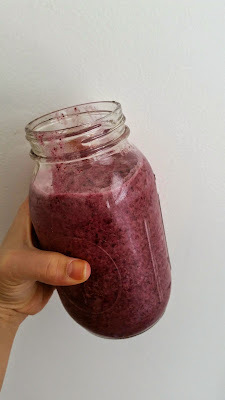 Beets are pretty strong tasting so I love putting them in smoothies...they give smoothies a deep red or purple color and sweeten up the smoothie a little bit. A great combination for a smoothie is beets, strawberries and a banana. I made a beet smoothie a few weeks that I want to share today. Combine in your food processor. Throw in a few teaspoons of cinnamon too if you wish. You can taste the beets in this smoothie but they are not overpowering. The banana sweetens up the smoothie while the blueberries give the smoothie an even bigger boost of antioxidant power. Love!! I tried a shot of wheatgrass today...potent tasting but also slightly sweet. I'm hoping to incorporate this green into my daily routine. Get your greens any way you can, a smoothie, a salad, steamed veggies etc.